Something like this sure as hell sounds like civil war. Militia gunmen went on the rampage in a Sunni district of Baghdad on Sunday, killing dozens of people in the bloodiest of many outbreaks of sectarian violence that have raised fears of civil war. The shooting began in an area close to a Shi'ite mosque in mainly Sunni west Baghdad, where a car bomb killed three people late on Saturday. Houses were also burning, police said. 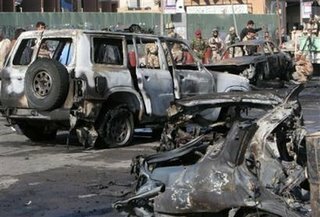 An Interior Ministry source said at least 38 people had been killed in Jihad district, while politicians from the once-dominant Sunni Arab minority put the provisional death toll at least 40, including women and children. Both police and politicians blamed rogue police commandos and the Mehdi Army militia of Shi'ite cleric Moqtada al-Sadr for the killings, but officials from Sadr's movement, part of the ruling Shi'ite Islamist bloc, denied any involvement. Civil war is happening in Iraq and in a civil war, an outsider (read US) doesn't belong or help. The carnage is going to be horrible, but our troops won't stop it and could very well make matters worse. WTF Kind Of Trend Is This?